Pizza slices are on the front of the toy, solid on the back. 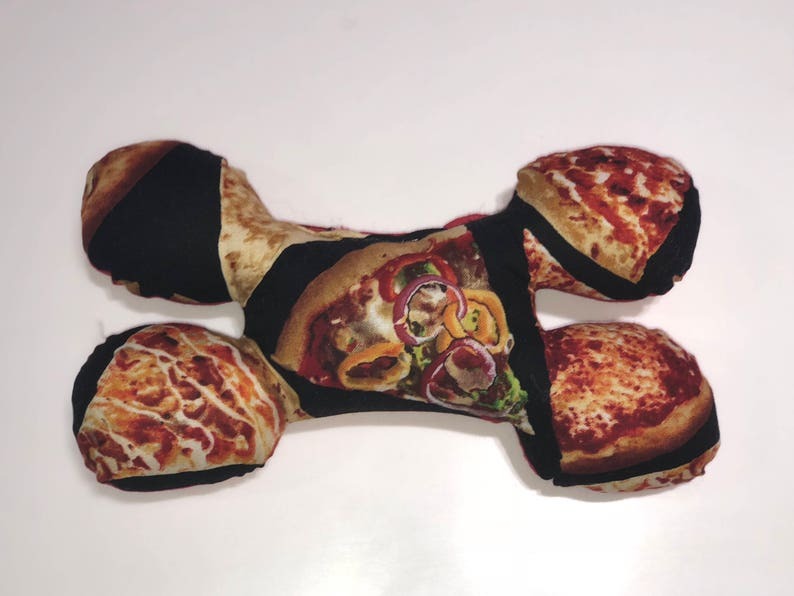 *Pizza slices will vary depending on where fabric is cut!! Squeak toys measurements are based on size: mini's are 7" x 4". The original's are 9" x 5". The jumbo are 11" x 6" made for dogs of all sizes (dachshund tested, pit bull approved!!) Squeaks are made with print on the front and solid contrasting color on the back. I will post of additional backing colors are available. If you would like squeak to be all over pattern please request a custom order, it will be $1 additional. Can be made without the squeak! Cotton fabric with polyfil stuffing. The internal squeak is plastic (please make sure to check toy for rips and tears from time to time, we don’t want anyone to get hurt or choke if squeak gets exposed!!!) To keep clean wipe down with a wet cloth.